One of my college friends came to speak in chapel at our alma mater today. I packed a backpack of goldfish crackers, crayons, and sippy cups, and drove down the road to hear her. Another dear friend drove from Oklahoma today for this event. We sat in the balcony, me with my boys and she with her husband, and watched students file in, just as we did a decade ago. Except now they are allowed to wear shorts in chapel, which was a no-no when we were there. The music started, and I didn't know any of the three songs that they sang. We sang a lot of Shout to the Lord when I was there, but that didn't make the worship set today. Our friend was introduced and we cheered loudly. I made sure to not stand up and shout,"Walther Second South!" as I once did at a pep rally. My youngest had a hard time during the message, so we sat in the hallway for half of it, but I could still hear. And I was so proud of the words Lisa shared, the person God has called her to be, the way He has changed her, the way He has changed most of us in the last ten years. She only had about an hour after chapel to visit, but it was good catching up. Then Deb and I drove up the street for lunch and talked in person the way old friends do when they haven't seen each other in months. We spent two hours filling in the details without having to give the back story of crazy family members, disappointments, challenges, exciting things yet to come. Bugaboo had a hard time at lunch. He gets like that sometimes when we are out in public. He gets frustrated or he fixates on something, and his lack of communication skills means he screams/cries, and I am left feeling a little helpless as I try to calm him without much success. My tears welled up over hamburgers during Bug's episodes. I felt embarrassed, sad and frustrated. My dear friend looked across the table a few different times today and told me, "You're a good mom. You're doing a good job." It meant the world to me. A decade ago we were surviving living on a floor with thirty other young women. We were eating ice cream in the hallway or ordering pizza on Sunday nights. We were hurrying in from the cheap theater to make curfew on Fridays and regularly listening to Sara Groves as we contemplated what to do with our lives. Where I am right now is not at all where I thought I would be ten years ago. Some of it is exactly what I wanted, and some of it would have terrified me if I could have looked into the future back then. Our floor was called The Way. 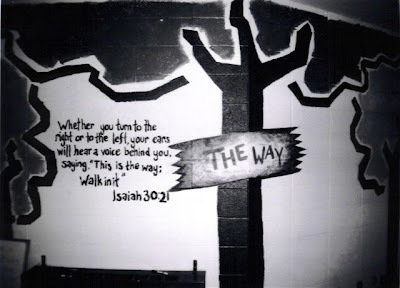 My freshman year we painted a verse and other things on the walls. Back then that verse didn't mean as much to me - it meant listening to God's voice about a major, a career, and hopefully a husband (didn't find mine there). But today I sit looking at that old picture, "This is the way, walk in it." This is the path God has for me right now - to be a mom to my two boys and to somehow make a difference in the world around me right in front of me. God's voice doesn't just direct college students, He is still directing me, a decade later. "You're doing a good job. Keep walking." Thanks! Facebook helps, but even online I am not as on top of friendships as I should be. Luckily both of these friends are the type where you can just pick up where you left off. There is something so comforting about that - like a favorite pair of jeans. I am thankful. I have some very great and understanding friends. Right now it is hard b/c G is delayed, doesn't really have words (at least not in ways to help communicate when he is frustrated/sad/hurt), plus he is two so that even in a "non-delayed" child is difficult. Thank you for your encouraging story of success in communicating about the ice cream social. That truly gives me such hope. the power of "I get it."